Located in local Brookston, Indiana, Twinrocker Handmade Papers, has been instrumental in the resurgence of fine handmade paper used in the modern era. 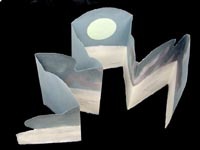 Artists and bookmakers around the world have used their papers, and they maintain a full schedule of production on artists' projects. Twinrocker's owners and operators, Kathryn and Howard Clark, have assembled this exhibit from the collections of anonymous lenders.